Home/Posts/Article, Essential Oils, Library/Which essential oils should I start with? So many aromatics, so little time! The world of essential oils and aromatic extracts is full of exciting possibilities. When we first start out it is easy to become overwhelmed by choice. And it’s not cheap! People often ask me which oils they should start out with. It’s a difficult question to answer, and while I do have a suggested list in my Aromatic Dog book it is not definitive, could easily contain different oils and really depends on the animals who share your life. There are a few ‘must have’ essential oils/hydrosols (you could have one or the other) such as lavender (Lavandula angustifolia), yarrow (Achillea millefolium), helichrysum (Helichrysum Italicum), lemon (Citrus limonum), frankincense (Boswellia carterii). And there are personal favourites. For me these are Angelica root (Angelica archangelia) and neroli (Citrus aurantium var bigarade), or my latest discoveries white lavender (Lavandula viridis) and lentisk (P.Lentiscus). But each of us will have different favourites, that may change over time. My suggestion when starting out is to go slow. A good way is to make a shortlist, as suggested in my books and buy a few items you think your fur family could use and start to play around with them. 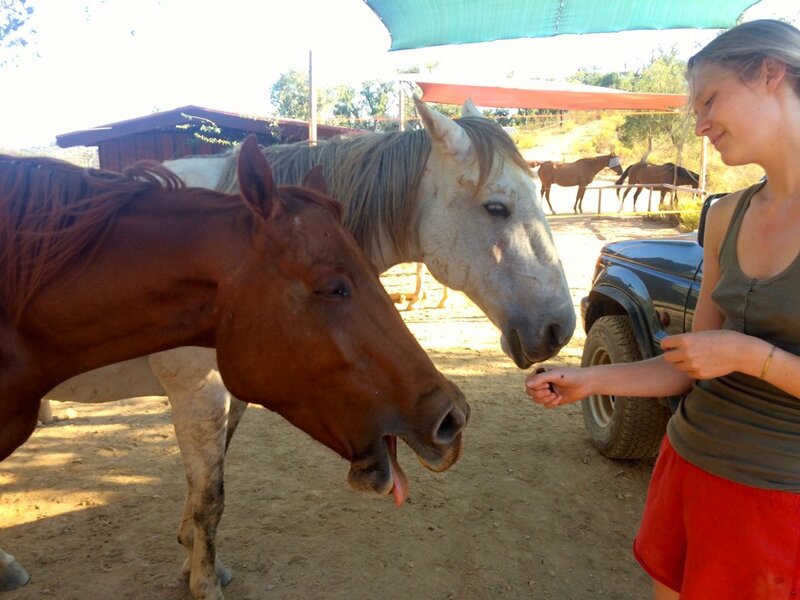 When I am getting to know a new aromatic I offer it to all the horses, dogs and humans around me. Seeing who interacts with an aromatic and knowing their issues helps me understand the relevant uses. I look for any research done and what qualified aromatherapists are saying about it. I do NOT rely on mommy blogs and hearsay, and if I see something repeated in similar language in different sites I look for the source of that information. The other day we distilled the leaves of Pistacia lentiscus, a shrub that grows wild on my farm in Portugal, and which I have not used much. 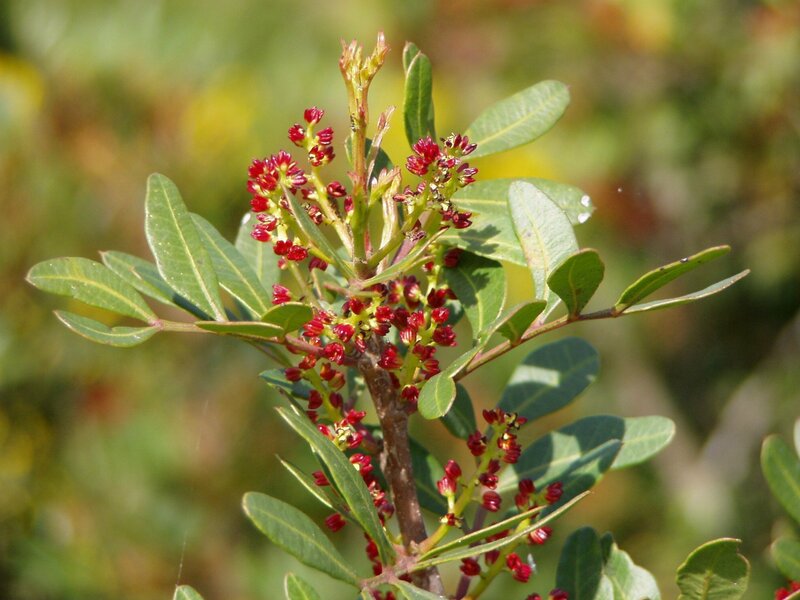 Essential oil steam distilled from the leaves is known as lentisk, or the resin of the same shrub is called mastic. We produced a beautiful aromatic water, not removing the essential oil from hydrosol. The first place I start to get to know this aromatic is in my own body. So I smell it. It is a smoky, sweet, resinous and piney fragrance that opens the respiratory system and clears the mind, while making me feel strongly present in the body. The strong effect on the lungs makes sense. Essential oils from leaves often support the Metal element functions, of breathing, skin health, immune function and letting go. The season of Metal is autumn. Here in Portugal we are shifting from Late Summer (Earth) to autumn. This shrub is strongly resinous and we included some berries in the distillation, both of which have affinity with Earth element. The clarifying, grounding quality of the oil is part of the Earth function. I expect the distillate to support Stomach and Spleen as well as Lung and Large Intestine, and particularly the transition from one season to another, which can often exacerbate any issues. We offered the hydrosol to the horses the morning after distilling to gauge their responses. There was a wild wind and it really felt like autumn transition had arrived. Interestingly, more horses than is usual were interacting with the hydrosol, possibly because the weather was so fitting to the aromatic profile. 8 out of 10 horses had at least a passing interest in the offering. There was trancing and release through yawning after inhalation of the undiluted hydrosol. None of them wanted to lick it (though the 2 youngsters were eating the post distillation leaves that we had thrown nearby). The strongest response was from Sam, 13 year old gelding with non-malignant tumours at various sites on his body. He smelled the proffered bottle intently for some minutes. Then he turned his head back to his flank quite sharply. I thought he was irritated by a fly, but on the third time I went to investigate and he had been pointing at one of his nodules (it was wet from his nose touching it). I put some hydrosol on my hand and offered to rub it on the nodule. He allowed me to do this and then had a release of breath. I anointed his other nodules in the same way, which he was happy for me to do. Now I am never going to forget what to use Lentisk for after that! You can apply this methodology to any aromatic you want to know better. Smell it yourself, being aware of where and how it affects you. Offer to your animals and see who interacts. Read about it in books. Get to know your essential oils and slowly build a relationship with each one. As you slowly build your kit you will start to trust your knowledge and intuition. You will find that a small selection of aromatics will cover a large range of situations and you will know exactly when to use each one. You can read the full profile of Lentisk here.